The Shen Yun dancers have officially left the building — but not before roping Vermont Lt. Gov. David Zuckerman into providing the international dance troupe with a glowing endorsement. Unbeknownst to Zuckerman, the company quickly incorporated his television "interview" into Shen Yun's massive marketing machine. 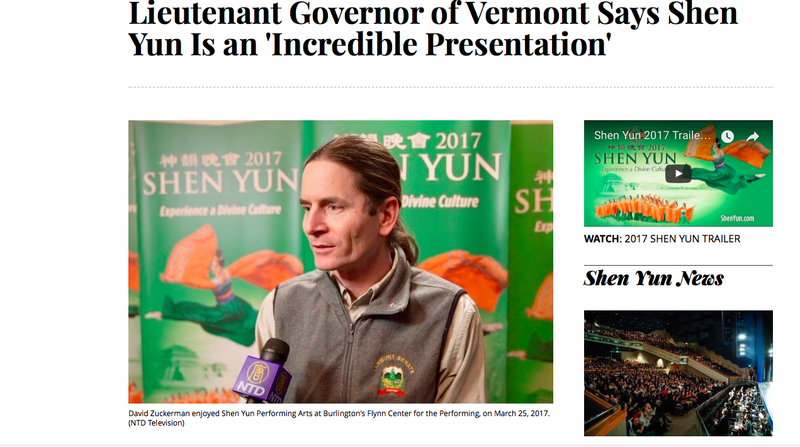 "Lieutenant Governor of Vermont Says Shen Yun Is an 'Incredible Presentation,'" reads the Epoch Times, a New York City-based anti-Communist China newspaper founded in 2000 by members of the Falun Gong spiritual movement. In a phone interview Monday, Zuckerman explained that Shen Yun Performing Arts invited him to welcome the company to Burlington for its March 25 evening show at the Flynn Center for the Performing Arts. The Flynn provided him with a ticket to attend, according to Zuckerman, who said he plans to reimburse the theater. Zuckerman went on stage to introduce the troupe and presented Shen Yun representatives with an official "certificate of appreciation," expressing his appreciation for "their contribution to the arts and culture." Zuckerman, who said he knew little about Shen Yun prior to the performance, described it as "an interesting combination of art and religion." "I was mostly thinking that we had an opportunity to learn about the ancient arts and dance from other cultures, which in this day and age, are both things that we need more of, given the sentiments out of Washington," Zuckerman said. Last week, Seven Days published "The Story Behind Lavish Chinese Dance Extravaganza Shen Yun." The company rolled out an enormously expensive and ubiquitous marketing campaign throughout Vermont and Seven Days examined some of the religious and political underpinnings of the New York-based Chinese dance troupe. 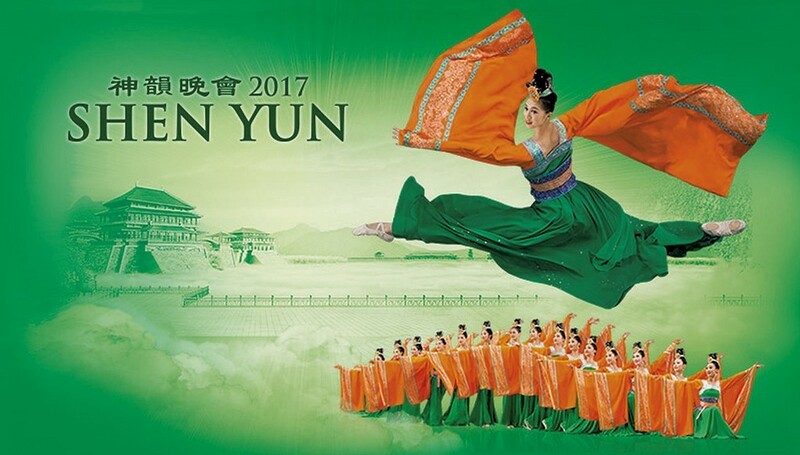 As we discovered, Shen Yun Performing Arts was formed by members of Falun Gong, a Chinese religious movement founded in 1992 by its spiritual leader, Li Hongzhi. In 1999, Falun Gong, also known in the United States as Falun Dafa, was officially labeled a cult by the Chinese government and was outlawed. Since then, Falun Gong followers in China claim to have become targets of considerable persecution by Chinese authorities, including lengthy prison sentences in work camps, executions and the harvesting of their organs for transplantation. The Chinese government vehemently denies those claims. For his part, Zuckerman said was unaware of any of the politics or controversy surrounding Shen Yun, which one U.S.-based expert on cults referred to as the "marketing and recruitment arm" of "Master Li's financial empire." Li himself claims to possess supernatural powers that can purportedly "heal" diabetes. He has also been criticized by members of the LGBT community, among others, for his controversial remarks about miscegenation and mixed-race offspring, which he once said "confuses the gods." Li has also described homosexuality as "filthy," "deviant," "repulsive" and "incestuous," and has predicted that gays will be "the gods' first target for annihilation." However, Falun Gong members insist that their spiritual movement is not a cult but simply a peaceful spiritual practice that teaches truth, compassion and tolerance. The dance troupe, currently on a 30-country world tour, heavily markets itself as an effort to preserve 5,000 years of Chinese art and culture which, it says, China's Communist Party has systematically tried to eradicate. Zuckerman said that he was interviewed at the Flynn by a TV crew, which he assumed was part of the dance company itself. The Chinese interviewer asked him very "leading questions" about the show and "the whole divine stuff," which Zuckerman characterized as "an orchestrated set-up." "I began to get a little more wary when those questions were coming my way," he noted. Zuckerman said he tried to steer his remarks back to the artistic components of the show. As he put it, "I appreciated the art form. I wasn't as enthusiastic about the religious overtones." By Monday morning, Zuckerman's photo and comments were on the website of the Epoch Times, which has been described as the voice of Falun Gong in the West. The interviewer was from New Tang Dynasty Television, which was founded by Falun Gong practitioners and bills itself as "the world's largest Chinese media company outside China — a rare independent one — covering all issues relevant to Chinese the world over." The site also solicited enthusiastic testimonials from other theater-goers at the Burlington shows — as well as at performances around the world. Zuckerman said that he wasn't aware that his words and image were being used to market Shen Yun until being asked about it by a Seven Days reporter.